Just a quick note to let you know of an updated post on public transport patronage trends. I’ve got almost all 2010-11 data for Australian and now New Zealand cities. Patronage is growing strongly in Perth, Melbourne and Auckland. South East Queensland has possibly stalled, although issues in patronage estimation methodology may be masking underlying growth. Adelaide and Wellington are showing more modest growth, while Sydney, Canberra and Hobart continue to be laggards. Christchurch patronage unfortunately collapsed following the terrible earthquake. 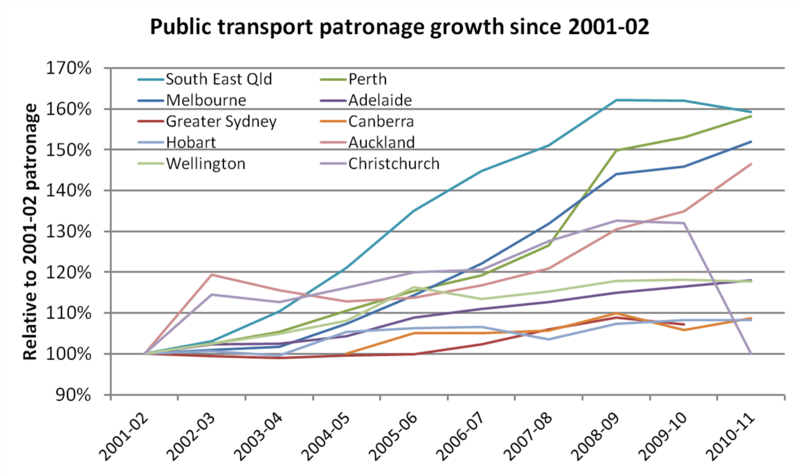 For all the details, as well as some 110 year trends in Australian public transport patronage, read the updated post. In other news, this blog is now available at the easier to remember address chartingtransport.com and there is a new public twitter stream if you want to track updates that way. This entry was posted on Monday, November 14th, 2011 at 12:33 pm and is filed under Uncategorized. You can follow any responses to this entry through the RSS 2.0 feed. You can leave a response, or trackback from your own site.